Lords Meade Vocational College focuses on producing well-rounded members of society, and the curriculum reflects this. Lords Meade offers complete "O" and "A" level academic courses through a syllabus recommended by the Ugandan Ministry of Education and Sports. With an emphasis on using both the hands and the head, vocational training is an integral part of the syllabus. Team sports and group activities play a role in the development of a future leader, and these are important aspects of student life at Lords Meade. Students are divided into 'houses' to promote teamwork. Given the background of many of the students, life skills and counselling are provided as part of their learning. With a goal to develop independent members of community, Lords Meade is developing programs aimed at both the students and the community at large in such areas as small business development. Students are keen to obtain their education in class. Uniform is worn as it makes it cheaper for the parents / guardians as all students wear the same. 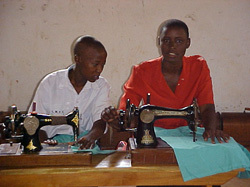 as they learn skills that will sustain them in later life. Uganda today: With over 2 million children orphaned by HIV / AIDS – out of a population of about 30 million - many children face a bleak future when their parents or sponsors can no longer support them – usually due to ill health and subsequently death. Usually the grief of the loss of the person who has been supporting the child comes second to the concern over the future of the child's education – there is no free secondary education in Uganda – so no fees equals no education – and the child is usually sent to spend his or her life back in the village where the family originally came from – often living with the grandparents – and trying to find simple work to eek out an existence. Many of the girls wait until they are old enough and then are married off – probably continuing the cycle of poverty and illiteracy – not to mention their broken dreams. Some will eventually resort to simple prostitution in order to raise money for their school fees. Uganda is the only country in the world to have a negative growth rate in HIV / AIDS. This has been achieved through creating awareness to the general public and the acceptance of the existence of HIV / AIDS. However the parents may have contracted the HIV / AIDS virus, it does not mean that the children should be punished for their parents’ actions. Hand up – not Hand out! By providing education to an orphan one is promoting literacy, poverty alleviation and giving a chance to more than one child, as invariably any beneficiary will support their siblings – or even an orphan from another family. Peter was the first disadvantaged child to benefit from a Hand-Up – in 1988 his father could not afford to continue paying his school fees and he was dropping out of school – his dream was to achieve his secondary education. In 2005 he married Ruth, and now they have a baby, Joshua. Today he is educating 5 of his 13 siblings. He is a director of the Tofta Educational Trust and the Lords Meade Vocational College, as well as being the Field Officer for the Tofta Educational Trust. 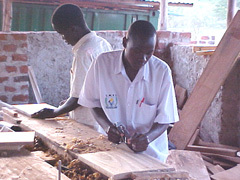 He is also active in the local Rotary Club in Jinja, Uganda. Peter supervised the construction of the Lords Meade Vocational College. Peter (centre) with his half-brother and half-sister. Their father and mothers all died of HIV/AIDS. For $720 (GB£360) a year you can offer a grieving child the dream of completing their education and enabling them to achieve a meaningful life.